Ceremony in their honor was held Saturday at the Commemorative Air Force Museum in Mesa. MESA, AZ — Thursday marks the 6th annual 'Tuskegee Airmen Commemoration Day' in Arizona. The Tuskegee Airmen were the first African American military aviators in the United States Armed Forces. A ceremony in their honor was held Saturday at the Commemorative Air Force Museum in Mesa. There are currently eight surviving Tuskegee Airmen living in Arizona. Former Governor Jan Brewer established a law six years ago that the fourth Thursday in March would serve as the commemoration day. 93-year-old Lieutenant Colonel Robert Ashby is one of them. He spoke with ABC15 about the difficulties the men went through. "It was a hardship, being separated and isolated and segregated," he said. "What we did was put all our efforts into getting ready to be integrated and do our job to accomplish what we were intended to do." Ben Bruce, with the Tuskegee Airmen's Arizona Chapter, says it is important to teach others about what African Americans went through, once they were able to join the military. 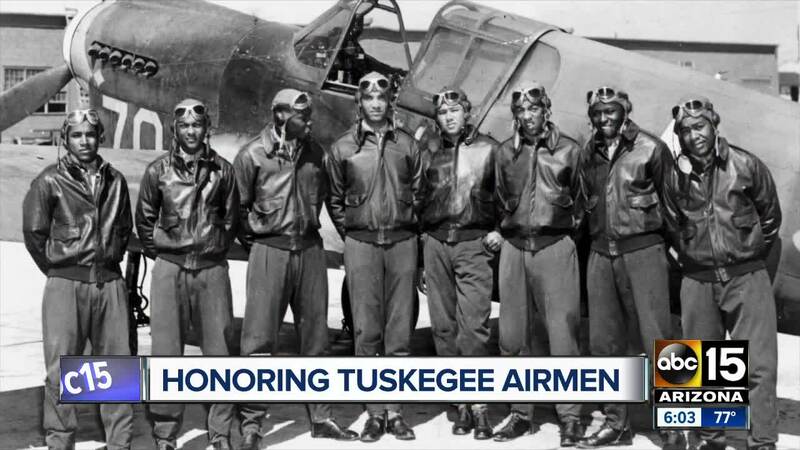 "It's important to understand that most Americans do not know that blacks served in combat positions," Ben Bruce with the Tuskegee Airmen's Arizona chapter said. While it had been 78 years since they first suited up, Bruce says the veterans are finally getting the recognition they deserve. "It's a long time coming, but at last it's here," Ashby said. Two squadrons from the original Tuskegee Airmen group are now part of an air group at Luke Air Force Base.